The subject of shutters on mid-century homes has become a contentious debate in the world of MCM home ownership. 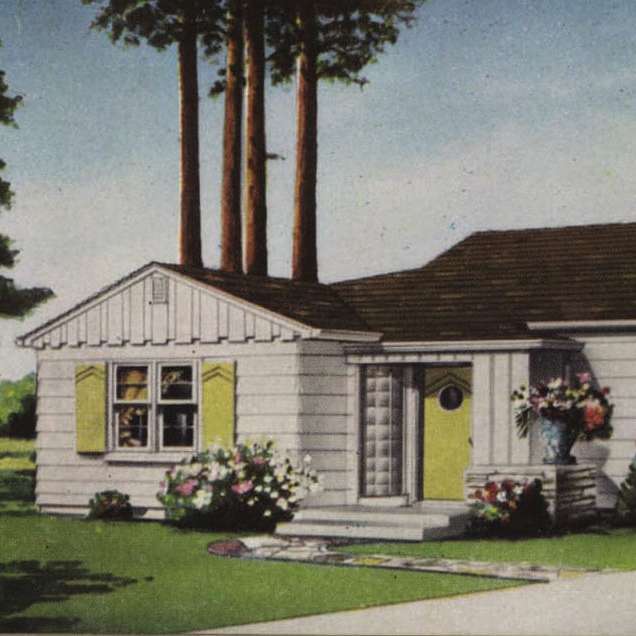 Purists believe that there is no room for shutters on mid-century homes. Others are architectural purists who believe that only functional shutters (or shutters that appear functional) have a place on any home. To be completely up-front with you, I am an architect living in a mid-century home, so you might think that I would side with both camps above. I don’t. Let me tell you why. 1948 Hiawatha Estates No 217 - Shutters on a picture window but somehow they work since they match the scale of the muntin spacing. To get scholarly, the original location for shutters is the interior of a window. Before glass windows, shutters provided ventilation, light control, and protection from nefarious armies invading your fortress. Fortresses, as you may imagine, have very thick walls, and shutters were hung on the inside of the opening purely so that they were reachable. As larger stone structures gave way to smaller frame structures, shutters began to appear on the exterior of homes. As early as Victorian times, when glass windows were more ubiquitous, exterior shutters often became nothing more than ornaments meant to dress up the façade. They still had a use for controlling light and ventilation, but they were no longer a fortifying element. 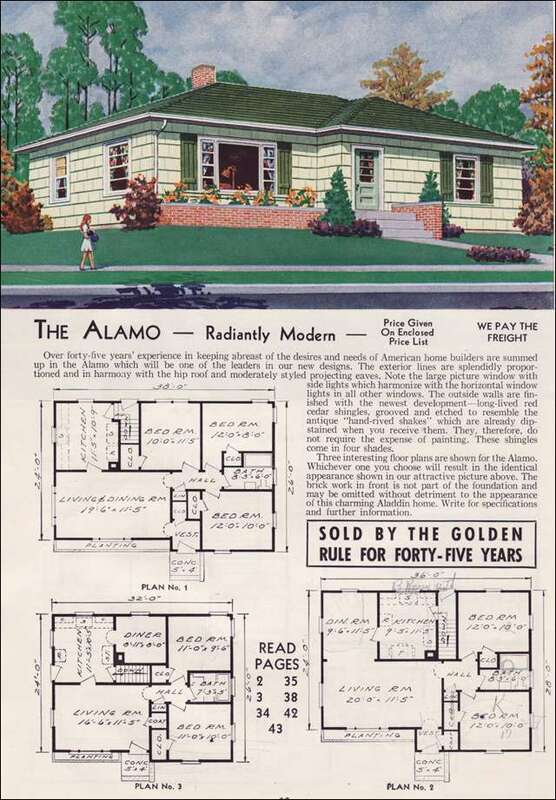 1951 Aladdin Kit Home - The Alamo - You'll see time and again how shutters are used decoratively but only on the front face. Kind of like faux brick facades today? Fast forward to the 20th century. Exterior shutters were sometimes still used to control ventilation, but as the year's progressed, even this function became supplanted by electricity, fans, and air conditioning. In fact, air conditioning hit its heyday in 1953 with more than one million units sold. Shutters? Who needed shutters anymore? Operable shutters became a thing of the past, and the modern homeowner of the 1950’s and 60’s used shutters purely as decorative elements for their homes. 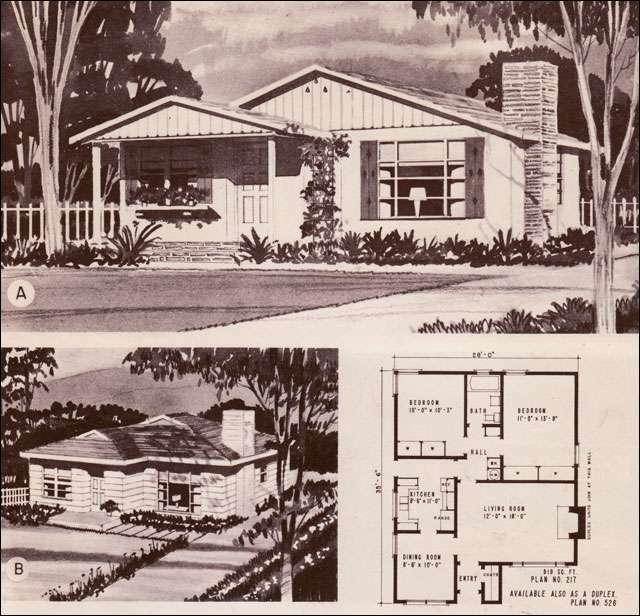 Looking in mid-century plan books, you’ll see decorative shutters on many a house. Will you find shutters on high-style modern homes such as Eichlers? No. 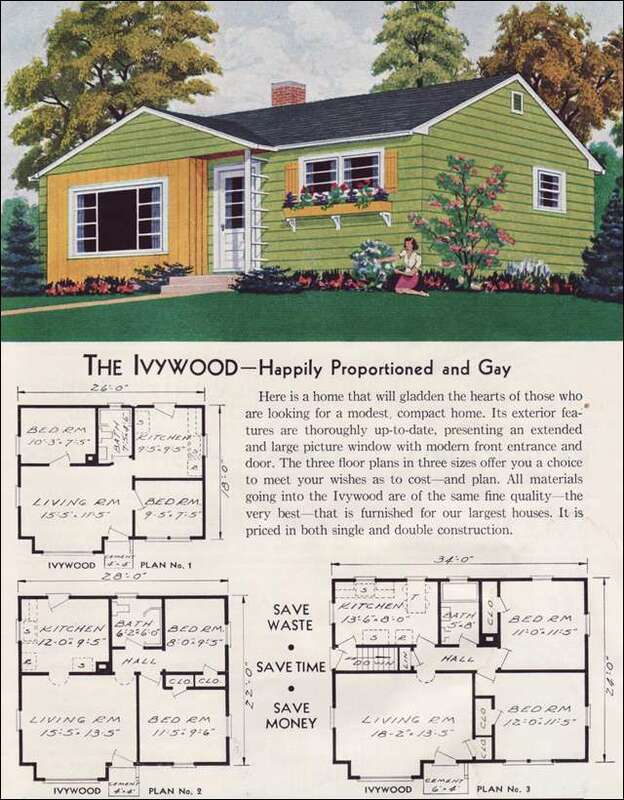 But you will find them on more modest houses of the mid-century period. 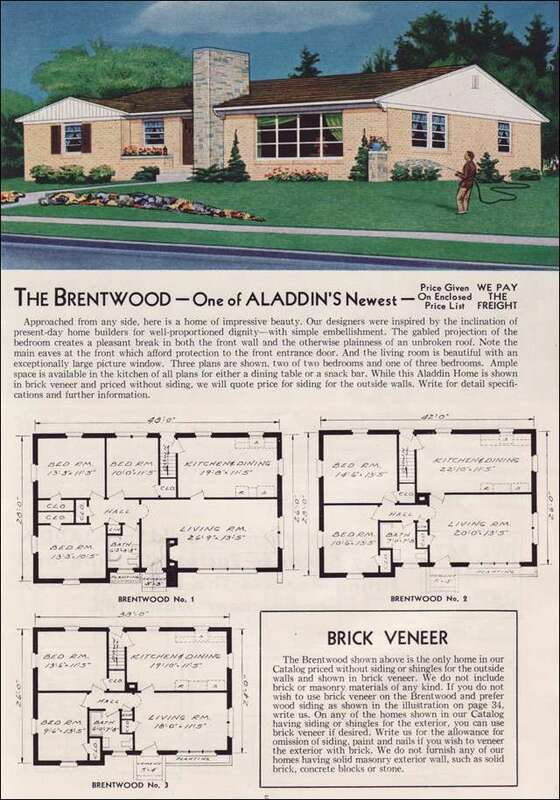 1951 Aladdin Kit Home - The Brentwood - here they are using shutters on the front and only on the appropriate window. The concept of a purely decorative shutter is still difficult for many to accept and you can find flame wars around the internet on whether or not this is acceptable. If we take the stance of home products and materials only being acceptable if they are functional, we could run into all sorts of issues. What of brick facades on today’s suburban homes? They are nothing but a covering and have no structural integrity like brick is meant to have. 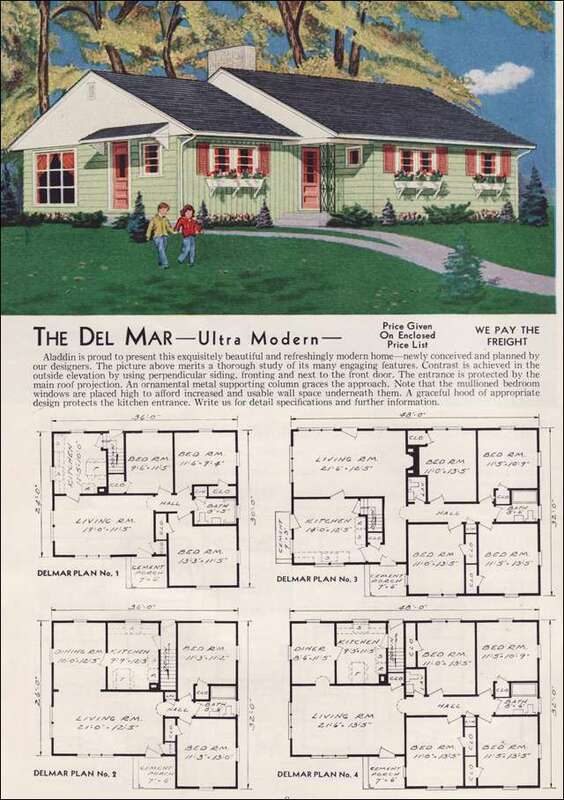 1951 Aladdin Kit Home - The Del Mar - Shutters everywhere on the front! But that color scheme - dreamy. 1951 Aladdin Kit Home - The Ivywood - These shutters are too small, but I like that the color of the shutters picks up the colorblocking of the house. How to use shutters on a mid-century home? Stick with shutters that convey the style of your home. If your shutters are to be decorative, they should make a statement about your house and accent the architecture. Think about a design for your shutters that is in tune with the design of your front or garage doors. Consider proportions. Your shutters should be half the width of the window. The shutter should mount adjacent to the window, not separated from the window from moldings. The shutter height should equal the height of the window, not the window plus the sill. 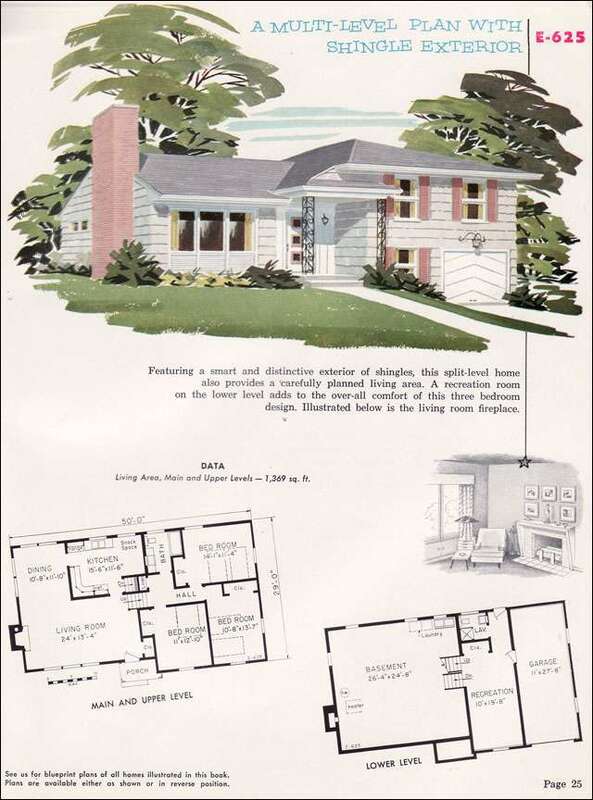 Last, even though vintage house plans exist showing this very thing, try not to use shutters on picture windows. 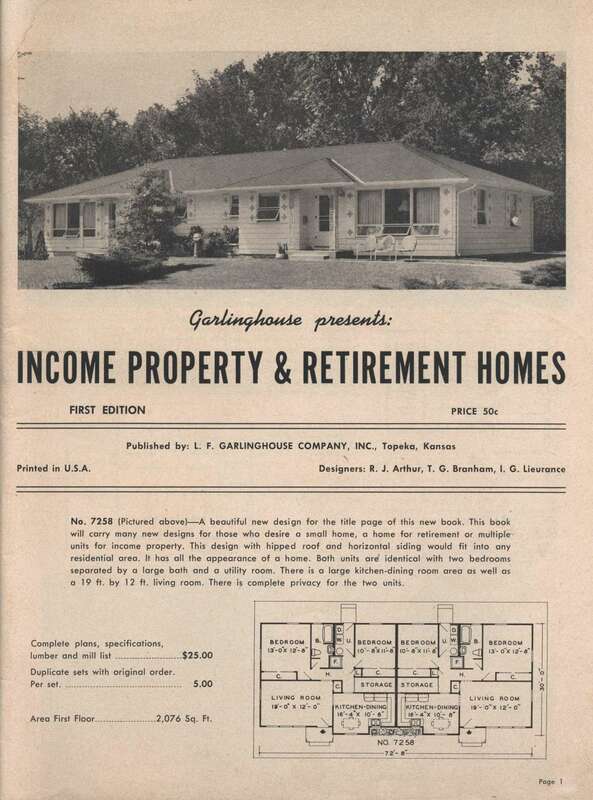 1955 Garlinghouse Income Property & Retirement Homes No 7258 - Shutters of every window - even the picture window and even the windows that are an awning style! 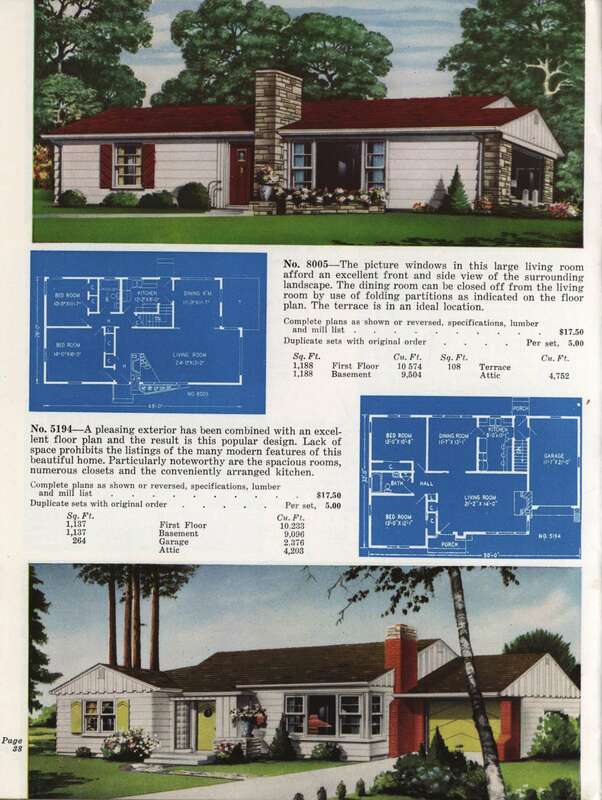 1955 Garlinghouse Plans Nos 8005 and 5194 - The bottom image is one of my favorites. Notice how the front door, garage door and shutters all have the same chevron shapes and share the same chartreuse color. E-625 from the 1955 National Plan Service Catalog. Look at this perfect use of shutter! 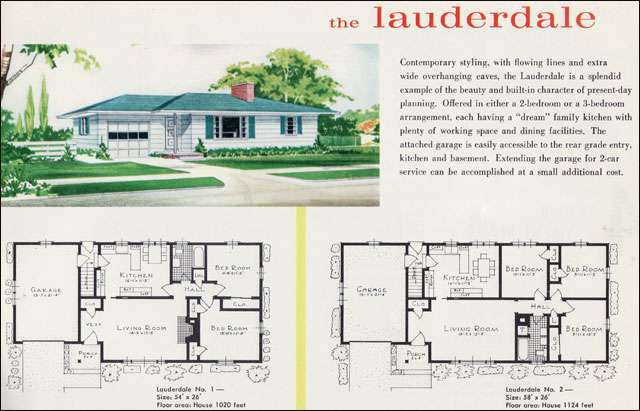 1960 Liberty Ready Cut Homes - The Lauderdale - Shutters again on the picture window. Phew! That was a lot of don’ts. What about the do? Do your research. Tour your neighborhood to look for houses that have shutters done right. Peruse old house plans to find inspiration. Last, don’t run to the nearest big-box for shutters. Chances are they won’t have a style that befits your mid-century home. Last? You do you. Do what makes you happy. Life is too short to get upset over shutters! 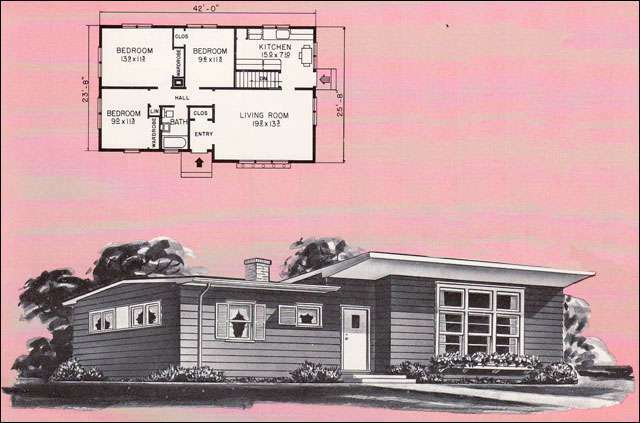 1961 Weyerhauser Plans No 5136 - even I'll admit that this one is a little crazy. Check out that small windows next to the door that only has one shutter? Maybe it's correct, but I think that looks weirder than shutters on a picture window! 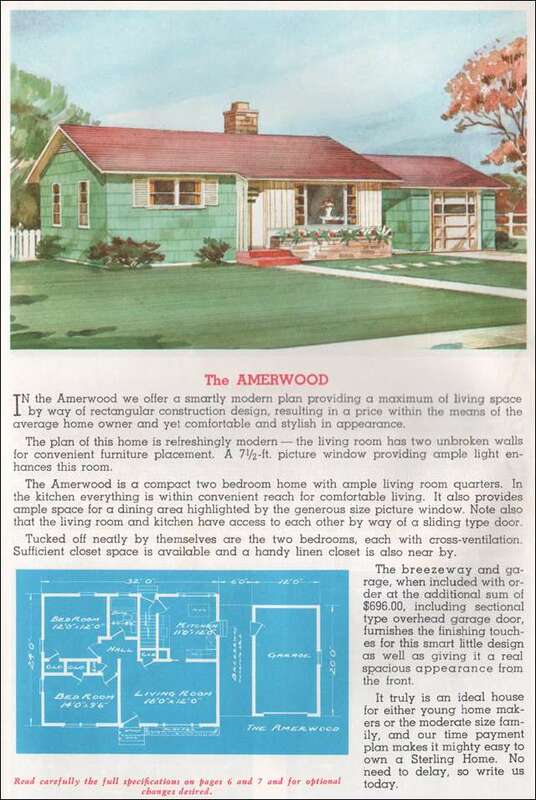 1962 Sterling Homes - The Amerwood - With this final image, you'll see that decorative shutters were a thing all throughout the late '40s into the '60s. Love it or hate it, it is historically accurate for the time. Do you have decorative shutters on your home? We’d love to hear from you and see photos! Drop us a line on Facebook, send us an email or tag your photos with #makeitmidcentury on Twitter or Instagram. I can’t wait to hear from you!